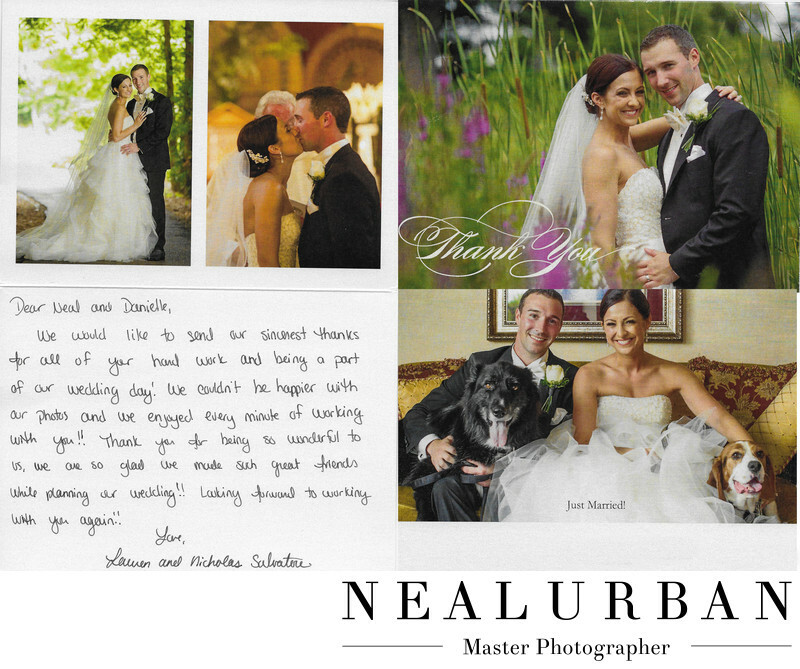 Thank you cards are a great way to show off our photos. They are even better when there are dogs in them! Nick and Lauren love their dogs. They were part of the engagement session at Spring Lake Winery in Lockport, NY. Then they were part of the wedding day! They used a photo from every part of the day! There is a photo from their ceremony at Assumption Church in Buffalo. It is their first kiss photo! We then went to Park Country Club in Amherst for photos. The bride and groom are members there, so we could go almost anywhere we wanted! At one point we had the entire wedding party driving golf carts to certain holes for photos! That was fun! The image that you see on the top left was done on a golf cart path. It is the prettiest spot. The trees form a tunnel and the back light was gorgeous. At another golf hole, there were beautiful purple flowers. This area was great for a smile for the camera and one for the parents photo. We say that because the parents to do not want to see all kissing photos. Lastly, is the portrait with the dogs. Now, this was taken at the wedding venue at Salvatore's Italian Gardens. You may be wondering how that was possible. Well Nick is the son of the owner, so they could pretty much do what they wanted. The pups were brought in for about ten minutes for some quick photos. We loved this. We loved even more that they put this on their thank you card! Location: 6461 Transit Rd. Depew NY 14202 United States.